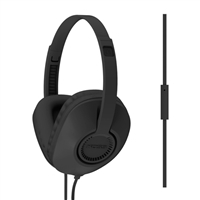 Full size over the ear headphone with In Line one touch microphone. Lightweight, durable construction with unique D-profile shaped Circumaural Leatherette cushions for superior sound and fit. 4 Foot Cord. 20-20,000 Hz frequency response. Koss Limited Lifetime Warranty.